Do you remember the Blue Garden Letters I did back in 2014? I am thinking of doing something similar again. Not exactly the same, it did not work out as I had planned. but I am playing with a few ideas. While I play with the new ideas I wonder if you are interesting in a postcard/travel letter from Iceland? Leave a comment on this post, and I will pick one of you. I am sitting here with a smile in my heart, I am so happy and thankful that my friend kept all the letters she started, put them together and in the end mailed them all to me. This way I could follow her through the year, and I know that she has been thinking of me, again, and again. Too often I start letters which I never finish. When I pick them up a week or a month later I think they are out of date and throw them away, starting something new. I will never do that again. I will continue where I stopped, and eventually mail it all. I used to have a penpal, a dear friend. We lived in different countries, living different lives, but out letters tied us together. Over the years we met several times, and the letters continued to flow. Some periods it could be months between every letter, at other times just a few day. Some years ago a misunderstanding happened, and we don´t have contact any more. My heart still shed tears because of this, but there seem to be nothing I can do about it. But I do have all my friend´s letters, and I do have all our shared memories. Nobody can ever take them away from me. The photos today are of the Blue Garden Letter #8 which I wrote for Susan. And thew Blue Garden Letter #9 goes to ARR. ARR; will you please email me your address. I have had so many things going on lately, the Blue Garden Letters did completely slip out of my mind. Letter #7 which goes to Marilyn is not yet written. Letter #8 is still a mystery, and yesterday, Sunday, I completely forgot it was a Blue Letter Day at all. Shame on me. But it is not too late still. It is never too late, is it :-) Today, a Monday but still a red calendar day, at least here in Norway, because of Pentecost, and actually a perfect day for writing letters, both Blue Garden Letters and other. Marilyn, your letter will be written today. The winner of letter #8 is......drum roll......Susan. And if you want to take part in the drawing for Blue Garden Letter #9, please leave a comment on this post. By the way, Terje and I are at the cabin. And after spending two weekend carrying water and watering the beds out here, it has been raining all night. Finally. A heavenly, blessed rain. All the flowers are smiling broadly today. You have been to Granny´s garden before. I blogged from a garden walk there last year, and here I am again. Granny is one of my long time blog readers, and she lives with her big family, on a dairy farm somewhere between The House in the Woods and our cabin. After visiting her last year, she inspired me to start a new bed in the shadows of a tree stump. This spring, she has inspired me to do something creative with an old tree root in my praying garden, The Serenity Garden. ....let your eyes rest on the beautiful view. I never leave Granny´s garden without a few new plants for The Blue Garden. That´s one of many wonderful things about gardeners, isn´t it, the love of sharing. Granny knows the names of all her plants, and she has buckets filled with garden knowledge. One day I would love to stay on her farm, being Granny´s apprentice. Last Sunday´s Blue Garden Letter, #7, goes to Marilyn, who is the owner of the most beautiful Delights of the Heart blog. Today´s Blue Garden Letter #8 will go to one of you. It is time for the 7th Blue Garden Letter. I will post the letter later today, but you can already start commenting if you want the "real" handwritten letter to be yours. Finally summer has arrived in The Blue Garden. A butterfly is visiting the greenhouse and the squirrels are busy on the bird feeder. I have been planting and weeding for hours, now it feels great to sit down with a glass of cold water, listening to the sounds in the garden, smelling the fragrances, enjoying the warm afternoon sun caressing my neck and my shoulders. A bumblebee is sucking nectar from some purple flowers. I am reading an article about bees and the colony collapse disorder. This frightens me. Nature is so vulnerable, and often it seems like we are all doing our best to destroy it. The Blue Garden is like a tiny little pinhed in the world, but this pinhead is mine and I want it to be a place where life can flourish. I feed the birds all year round. I don´t kind a few weeds, I let the wildflowers grow and I love the spiders and their webs. I am dreaming of bee hives, hens and chickens, but for the moment I can´t see how it can be done. in pleasure from that which is not good?" to yield its honey to the bee. receiving of pleasure is a need and an ecstacy. like the flowers and the bees. ps: the winner of the handwritten letter is yael from Israel. Yael, will you please send me your address. Another week has gone, and it is time for the sixth Blue Garden Letter. Last Sunday I mentioned for you that I was reading Katherine Swift´s The Morville Hours, and that this created a new idea concering my garden letters. For several years Swift wrote a weekly garden column in a British newspaper. In the introduction to The Morville Hours she writes about this and she sais that the column was like writing a personal letter to a wide group of friends. The idea this gave me is that I will write out the letter here in Britt-Arnhild´s House in the Woods, every Sunday. But the original letter will be a handwritten one, often with small surprises, and the one to receive the original, will be one of you who comment on the post. The letter will be written later today, out in the garden, and then copied here some time after that. But you can already now start to leave your comment. It is a sunny Sunday in The Blue Garden, and time to start another Blue Garden Letter, the fifth in this series. You can already now start commenting on this post if you want to "win" today´s letter, though the post will be updated through the day. There might be a surprise in today´s letter, which will make it into a stuffed letter (I love stuffed letters......) I am working on an idea. I will have to think a bit more, and then I might share the idea with you. The weather forecast tells today is the last day of snow. I try to believe it. And as we head towards warmer days, it is easy to enjoy the beauty of The Blue Garden where the plants have been believing in spring for a long time already. It is Sunday, we are making ourselves ready for a hike in the hills just behind the house and I am looking forward to write another Blue Garden Letter. Today´s letter will again be written from The Blue Garden, while I drink a cup of mint tea.....if I search I should manage to find leaves enough for a mug. If you want to recieve today´s letter, please add a comment to this post, and tomorrow I will pick one name. 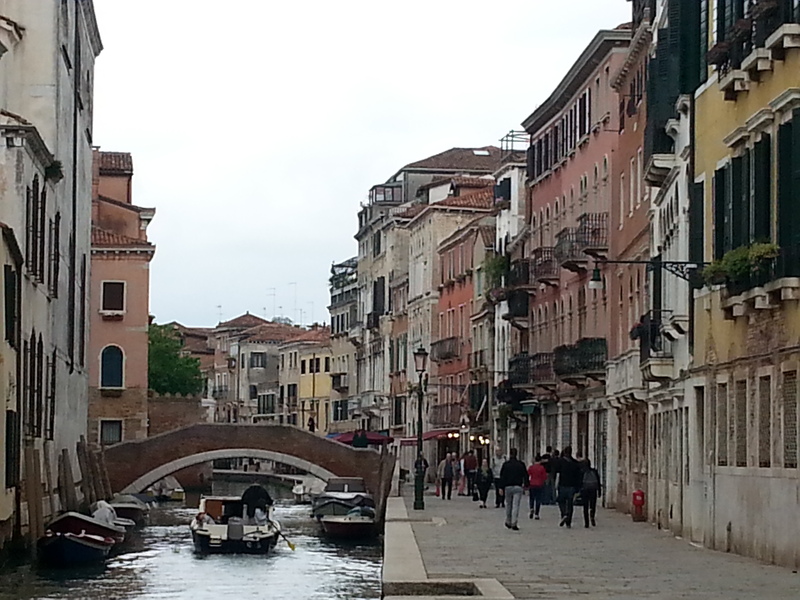 Most of this day has consisted of a lunch on Murano. One of Mauro's goal in life is to teach me everything about spaghetti vongole. Today this meant cooking while Terje and I watched every step. When I am back home I plan to write a proper post with a series of photos, meanwhile you can comment on this post and may be be the winner of todays Blue Garden Letter, aka Spaghetti Vongole at Casa Mauro Letter.